The traditions of this holiday, full of genuine humanity and kindness, high moral ideals, are being opened and rethought in our times. Do you know who painted the first Christmas card? And why does Christmas ring bells, and what do the candles symbolize? The Christmas wreath is of Lutheran origin. It is an evergreen wreath with four candles. The first candle is lit on Sunday four weeks before Christmas as a symbol of light that will come into the world with the birth of Christ. Every next Sunday they light one more candle. On the last Sunday before Christmas, all four candles are lit to illuminate the place where the wreath is located (it may be a church altar or a dining table). The bell ringing in Christmas time came to us from the winter pagan holidays. When the Earth was cold, it was believed that the sun had died, and the evil spirit was very strong. To drive out the evil spirit, you had to make a lot of noise. Until now, the Christmas tradition has continued to ring bells, singing and screaming at the same time. On Christmas Eve in the churches around the world, there is a bell ringing. But not for the expulsion of evil spirits. Thus, people welcome the coming of Christ. In Scandinavia, the bell ringing means the end of work and the beginning of the holiday, in England - funeral ringing at the funeral of the devil and the greeting of Christ. A Christmas tree for birds is a Scandinavian tradition. People try to share their joy on the Christmas holiday with other living beings. Directly in Christmas or on the eve of the birds bear seeds or crumbs of bread. It is a sign that the new year will be successful. A holiday on the street adds fun to the holiday in the house. Light was an important part of the winter pagan holidays. With the help of candles and fires cast out the forces of darkness and cold. Wax candles were distributed to the Romans in the festival of Saturnalia. In Christianity, candles are considered an additional symbol of the significance of Jesus as the Light of the World. In Victorian England traders each year gave their regular customers a candle. In many countries, Christmas candles mean the victory of light over darkness. Candles on paradise Tree gave birth to all of us, our favorite Christmas tree. In 1843, the Englishman Horsley drew the first Christmas card. 1000 copies Postcards were sold that year in London. 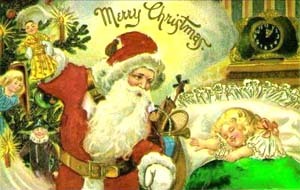 The publisher Louis Prang popularized Christmas cards in 1875. He spent in America A national contest for the best design of a Christmas card. Improvement Postal system and cheapening of postal items allowed the dispatch of Christmas Postcards to a lot of friends all over the world. This tradition has many roots. Saint Nicholas is traditionally considered the giver of gifts. In Rome there was a tradition to give gifts to children for the Saturnalia holiday. As a donator gifts can act himself, Jesus, Santa Claus, Befana (Italian Santa Claus female), Christmas gnomes, various saints. According to the old Finnish Traditions, gifts scattered at home invisible man. Before the advent of the Christmas tree in the mid-nineteenth century, England was so Called "a branch of kisses." It had the shape of a double ring adorned with garlands, Green branches, holly, ivy, apples, pears, lighted candles and mistletoe. If The girl happened to be under this branch, she was allowed to kiss. It is believed that the first unadorned Christmas trees appeared in Germany in the VIII century. The first mention of spruce is connected with the monk by Saint Boniface. Boniface read to the druids a sermon about Christmas. To convince the idolaters that the oak is not a sacred and inviolable tree, he cut down one of the oaks. When the felled oak fell, he threw all the trees on his way, except the young fir. Boniface presented the survival of spruce As a miracle and exclaimed: "Let this tree be the tree of Christ!". Later Christmas in Germany was marked by the planting of young firs. In a German source, dated 1561, it is said that Christmas can be no more than one Christmas tree per house. In the XVII century, the Christmas tree was already a common attribute of Christmas in Germany and the Scandinavian countries. At that time, the Christmas tree was decorated with figures and flowers carved from colored paper, apples, waffles, gilded things, sugar. The tradition of decorating a Christmas tree is connected with a tree of paradise, hung with apples. The success of the Christmas tree in the Protestant countries was even greater thanks to the legend that Martin Luther himself was the first to invent candles on a Christmas tree. One evening he went home, writing a sermon. The brilliance of the stars shimmering among the firs inspired him with reverence. To demonstrate this magnificent picture of the family, he put the Christmas tree in the main room, strengthened candles on its branches and lit them. Its popularity in England Christmas tree owes to the German prince Albert, Queen Victoria's husband. In the 17th century, German immigrants brought the Christmas tree tradition to America. 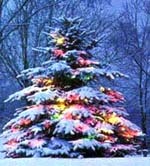 The first street Christmas trees with electric garlands appeared in Finland in 1906. Earlier during the Christmas celebration, one of the main dangers were Christmas candles. Therefore, in the living rooms kept buckets of water in case of fire. The idea to use electric garlands instead of wax candles belongs to the English telephonist Ralph Morris. By that time, the strings of electric bulbs had already been used in telephone switchboards, Morris had just come to mind to hang them on a Christmas tree. The first Christmas trees were decorated with fresh flowers and fruits. Later, sweets, nuts and other food were added. Then - Christmas candles. Such a load was, of course, too heavy for a tree. 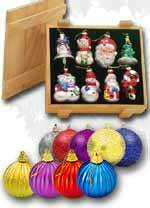 German glass blowers began to produce hollow glass Christmas toys to replace fruits and other heavy jewelry. The first guest is the first person who comes into the house and "lets in" Christmas (in some countries this tradition does not apply to Christmas, but to the New Year). Sometimes such a person is even specially hired to do everything properly, since there is a superstition connected with the first guest. The first guest should keep a spruce twig in his hand. He enters the front door, goes through the house and exits through the back door. He is presented with bread and salt or some small gift as a symbol of hospitality. The first guest must necessarily be a dark-haired man. If the first guest is a woman - it's a bad omen.